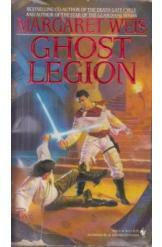 Ghost Legion by Margaret Weis, Sci Fi. Book is in good condition, all pages intact. The tenuous galactic peace is threatened both by the young king Dion Starfire's failing political marriage, and by an upstart rebel with an army of alien ghosts at his command. Once again, Dion must turn to his estranged mentor Derek Sagan to prevent the galaxy from tearing itself apart. Part of the Star of the Guardians series.